Whether he's acting or doing landscaping, Logan Moore '14 considers himself a workhorse. From the time he was a sophomore at Butler, Moore was performing in productions both on and off campus, and since graduating he's worked steadily at several theaters in central Indiana while retaining his job with a local landscaping company. In other words, he's living the life of a working actor. "I like hard work," he said. "I just do." Those who saw his most recent work, Actors Theatre of Indiana's production of Forbidden Broadway, can attest to that. In the show, a rapid-fire spoof of Broadway hits, cast members sing, dance, and act their way through multiple roles and costume changes galore. "Forbidden is one of the best shows I've ever been in," Moore said. "It's also one of the hardest shows I've ever done just because it's a marathon. Even in intermission, we're getting ready for the next numbers and setting up for Act 2. We get a five-minute break and then places get called." By the time Forbidden Broadway ended on July 29, Moore had already secured his next two roles, Seven Brides for Seven Brothers (August 30-October 7) and Man of La Mancha (October 11-November 18) at Beef and Boards dinner theater in Indianapolis, and Actors Theatre of Indiana invited him back for an updated version of Forbidden Broadway (April 26-May 19, 2019). "He’s got a good bit of the whole package," said Don Farrell, Artistic Director/Co-Founder of Actors Theatre of Indiana. "He has a beautiful voice. I was surprised at the range. He has the low notes for the bass, but he also goes into the tenor range as well. The clarity and the tone is really strong, and I just love the resonance of it too. His acting ability is very good. His comic timing is very good. He’s also a team player, which always goes, no matter what business you’re in. You give him a little direction and he can run with it. He’s a good mover, dancer. On top of it, he’s a good-looking guy too." Moore grew up on the eastside of Indianapolis, the second of six children. He's always been a singer—he sang in church choir with his family, and he sometimes traveled with his dad, who was part of a southern gospel quartet. He was homeschooled till eighth grade and hadn't thought about performing in public until his school drama teacher and choral director dragged him to an audition. "From then on, I liked being onstage," he said. "There's just something about the lights. When they shine and you're in front of them, you just forget that any audience is there and you're just in a different world. It's like playing make-believe for a job. And it's great." He went to Warren Central High School and chose Butler for college because he wanted to stay close to home and Butler felt like home. "Once you get on campus, you just know that you're in a good place," he said. "That was the first thing I felt on my first tour here. I couldn't believe it. I had never felt that feeling before—except when I was home. I love the class sizes, being able to have one-on-one time with the professors, the core curriculum, everything." At Butler, guest director Richard J Roberts, the dramaturg from the Indiana Repertory Theatre, cast him in Sarah Ruhl's Eurydice in the role A Nasty Interesting Man/The Lord of the Underworld. He also had parts in every production directed by the Christel DeHaan Visiting International Theatre Artists (VITA), guest directors from other countries who spend a semester working with Butler students and faculty. In one VITA production, The Priest and the Prostitute, Moore performed an intricate Indian dance known as kathakali. "The physical rigor of these pieces and the completely different style of working demanded a lot," Theatre Department Chair Diane Timmerman said, "and Logan delivered beautifully." "Not only was he a terrific actor while here at Butler, he also excelled in technical work, and, perhaps most notably, was one of the kindest and most generous students around. If anyone needed help with a project, Logan was first in line. And whenever anyone was down, he made a special point to seek them out and brighten their day." Moore said one of the lessons he learned at Butler is that acting is 80 percent connection and 20 percent talent. That stuck with him, especially since he had no connections. So he went out and met people. He did The Oedipus Trilogy at NoExit (a local theater company run by Butler graduates) and shows at Booth Tarkington Civic Theatre and Footlite Musicals. After graduation, Roberts, who directed Moore at Butler, put him up for the lead in Actors Theatre of Indiana's production of The 39 Steps. "For Richard to think that highly of Logan said something," Farrell said. "And Logan gave a great audition." Now four years out of college, with a resume that also includes The Fantasticks and The Mystery of Edwin Drood for Actors Theatre of Indiana, Romeo and Juliet at the Indiana Repertory Theatre, and Ghost the Musical at Beefs and Boards, Moore is toying with the idea of seeing what he can do in New York. He's been thinking about a trip there in April—his boyhood friend Jordan Donica is currently on Broadway in My Fair Lady—but he may well be working then. "It's not my favorite to decline work," he said. "If people are like, 'We need you for a show,' I'm there." Whether he's acting or doing landscaping, Logan Moore `14 considers himself a workhorse. Matthew Kraemer ’99 has been named Music Director and Principal Conductor of the Indianapolis Chamber Orchestra (ICO). Appointed Music Director of the Butler County (Pennsylvania) Symphony and the Erie (Pennsylvania) Chamber Orchestra in 2012, Kraemer has reinvigorated both ensembles with innovative programming and elevated artistic standards. 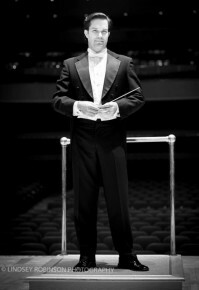 His active guest conducting schedule has included appearances with many of the nation’s finest orchestras, including the Atlanta, Baltimore, Houston, Indianapolis, Saint Louis, and Virginia symphony orchestras, as well as Canada’s Mississauga Symphony and Hamilton Philharmonic and in Europe with the Vidin Philharmonic and the Orquesta de Cadaqués. Kraemer also spent five years as associate conductor of the Buffalo Philharmonic, which under his watch experienced exponential growth in its award-winning education concerts program. Prior to his appointment in Buffalo, he served for three seasons as associate conductor of the Virginia Symphony Orchestra. The Indianapolis Chamber Orchestra’s mission is to advance and promote music composed for the small orchestra through professional concert performances and education programs. The ICO also provides accompaniment to many area arts and educational organizations. Broadcasts of its concerts can be heard on WFYI-FM (90.1) on Monday evenings. Wherever you look during the Phoenix Theatre’s upcoming production of the play Halftime With Don, Butler Theatre will be well represented. Onstage, Michael Hosp ’08 will be playing Ed, an aspiring sportswriter who meets his football hero, a man suffering from traumatic brain injury. The technical aspects of the show will be handled by Jeffery Martin, who studied at Butler from 2005-2009. And behind the scenes, Corbin Fritz ’18 is interning as he prepares for a career as a director. Over the past decade, Fonseca said, the Phoenix has hosted Butler interns, employed faculty members, collaborated with the department on projects, entertained and educated students through a formal program of attendance, advised incoming new students for the past five seasons, and employed former students as actors, technicians, and staff. “I think our relationship is a successful model for professional training,” he said. Let’s meet the Butler participants in Halftime With Don, which runs January 12-February 4. Michael Hosp grew up a couple of miles from Butler and went to school to be an actor. Ten years after graduation, he continues to rack up credits both day and night. In addition to performing in several other plays at the Phoenix, he’s appeared in and directed shows produced by several of Indianapolis’ most inventive theatre companies, including NoExit, EclecticPond, and Know No Stranger. Hosp also has worked on adaptations of two Kurt Vonnegut books for the IndyFringe stage, and this past summer he was in the Indianapolis Shakespeare Company’s presentation of As You Like It. Theatre is his full-time job too. During the day, Hosp works as an Actor-Interpreter at The Children’s Museum, where you might find him in the atrium dressed as a Transformer, or in one of the galleries doing a serious monologue while portraying historical figures such as Otto Frank, the father of Anne Frank. Halftime With Don playwright Ken Weitzman, who was in Indianapolis for the first three nights of rehearsal, said casting Hosp as Ed is an unusual move since Hosp is significantly taller than Bill Simmons, the actor who plays Don. Hosp said Butler gave him a great education in how to approach not only acting, but a career in theatre. Jeff Martin knew he wanted to be in theatre, and at Butler he found a mix that allowed him to experience acting as well as behind-the-scenes work. After graduation, Martin spent about a year in New York, where he did some acting and special-event tech work, including setting up the teleprompter and lighting for a speech by President Obama. He then moved to Atlanta and worked with theatre companies there for a couple of years, winning awards for his lighting work. In 2013, he saw on a Butler listserv that the Phoenix Theatre was looking for a technical director. That’s been his full-time job ever since, and he’s earned some acclaim for his innovative work. Martin also has worked regularly with Young Actors Theatre and also collaborated with Hosp on the two Vonnegut shows. Martin said the Phoenix keeps him busy, especially now that it’s getting ready to move into a new building just west of downtown Indianapolis. Having a fully rounded education has been important to his career, he said. Corbin Fritz ’18 spent much of his winter break at the Phoenix Theatre, where he’s interning with Bryan Fonseca, the director for Halftime With Don. Fritz wants to be a director—he plans to move to either Seattle or Denver after graduation—and he said getting this experience has been valuable. Fritz came to Butler from Noblesville, Indiana, planning to be an Education major, but he switched before classes started. During his time at Butler, Fritz has gotten a wide variety of experiences in acting, directing, and light, sound, and costume design. He’s studied at the Moscow Art Theatre, in London for a semester, and interned with the Indianapolis Shakespeare Company as an assistant director and production intern.